The agenda from just 1.5 days of the 2.5 day workshop. 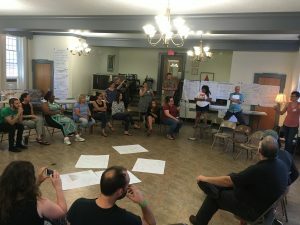 To be clear, the W.Va. Center for Civic Life doesn’t do “organizing” and “movement building,” at least not as those terms are most commonly understood. Nonetheless, the Training for Change team modeled and offered great insights into some really effective techniques that I think will really help me in what the Center does do: support citizens in convening and holding productive conversations about the issues facing their communities and West Virginia as a whole. In particular, after two and a half intense days with the TFC team, I feel like I have a lot more to offer as far as simple techniques that people can use to enliven group discussion forums and otherwise strengthen their own work. Activists: one of the best things that ever happened to the flip-chart industry. A lot of these techniques felt familiar, but they were used more intentionally than I am used to experiencing. 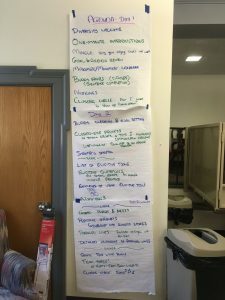 Like most people, I hate it when a trainer or facilitator says ‘all right, everyone, up on your feet.’ But this workshop helped me see the value that can be added by the thoughtful use of physical activities, group work, and elicitive educational techniques. A trainer talked about fun things we like to do in West Virginia: driving on “country roads” (heh), sitting on our porches talking with neighbors, and going whitewater rafting. It was posited that we drive in pairs, talk in threes, and raft in fours. Then, “up on your feet”: the group stood and mingled while the trainer called out “sit on your porch” or “drive” or “raft,” and the idea was that you linked up with the nearest one, two, or three other people to pantomime the activity. Then, at the end, when we were in a “rafting” scenario, the trainer told us to sit down with our rafting buddies to get ready to wok on the next activity. Now, this had all the trappings of one of those pointless-feeling activities where a facilitator orders you out of your seat “to get your blood moving,” or some silliness like that. But as we unpacked it later, especially considering what came before (a group discussion and work on the idea of mental flexibility) and after (work in those groups of four to discover and share personal experiences related to the topic), I really came to appreciate its utility. 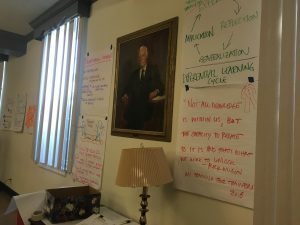 It felt ironic that so many West Virginia nonprofit employees and leaders were convened in a room watched over by a painting of Claude Worthington Benedum. Think about it: the ultimate goal was to get us in groups of four to do some potentially challenging reflecting and sharing. They could have had us count off by fours or some other more traditional way of breaking us up into groups. If they had, we would have arrived in those groups fully aware and anticipating that we were going to be doing some sort of group work—very “in our heads,” in a sense. Instead, we did a silly-feeling activity that had the effect of at least temporarily wiping out any long-term anticipation or big-picture thinking we might have been experiencing about the workshop. We arrived in randomly selected groups with our brains clear, and—yes—our blood moving, as a bonus. So that’s one I quite liked, and which I can easily see myself using. I even thought of a variation: for a facilitator who is working in a new area or with a new group, it could be useful to generate the list of “fun things we do around here” with the group, either as a direct lead-in to this activity (although that might draw it out a little long) or as an initial getting-to-know-you activity, with answers put on a flip chart that is then brought out for this activity. We tried too many other activities for me to list here, but suffice to say, as I mentioned earlier, I learned a lot and can see myself incorporating many of these activities into my own work. The training I attended will next be offered in New York City, November 11-13. Previous Post Another Civic Life Institute is in the record books! Next Post Are you missing a key team member?